Discover the power of soft with Fairy Non Bio Washing Liquid. It is no surprise that Fairy Non Bio was voted no.1 laundry brand for sensitive skin. Fairy Non Bio leaves clothes brilliantly clean and feeling gentle next to precious skin. That's because Fairy Non Bio contains natural ingredients that are designed to work in harmony with your skin to soften fabrics. Dermatologically tested, the Fairy Non Bio range has been awarded the Skin Health Alliance seal. Independent tests have confirmed that clothes washed in Fairy are as kind next to skin as clothes washed in water alone. The great way to leave clothes clean, fresh and beautifully soft even next to delicate skin. Washing Liquid is versatile, easy to use, and good for pre-soaking heavily soiled clothes too. Just pop a drop in a dosing ball, and add that direct to the heart of your wash, so all those magical Fairy ingredients can get to work straight away. Use with Fairy Fabric Conditioner for the softest combination for your baby's skin. Voted No.1 Laundry Brand for Sensitive Skin (online panel of 3347 females aged 18-70). Brilliant cleaning with new pre-treat cap for best laundry results. Dermatologically tested. Awarded with the Skin Health Alliance Seal. Cleans clothes brilliantly. Huggably soft for sensitive skin. Discover the power of gentle care with Fairy Non Bio Washing Liquid. It is no surprise that Fairy Non Bio was voted no.1 laundry brand for sensitive skin. 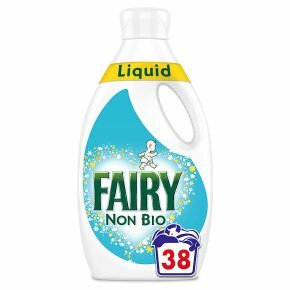 Fairy Non Bio leaves clothes brilliantly clean and feeling gentle next to precious skin. Unlike washing powder, washing liquid is versatile, easy to use, and good for pre-treating heavily soiled clothes too. Just pop the right amount in a dosing cap, and add that direct to the heart of your wash, so all those magical Fairy ingredients can get to work straight away. Use with Fairy Fabric Conditioner for the softest combination for your baby's skin. 38 washes based on 35ml per wash. *Online panel of 3347 females aged 18-70. For best laundry results; pour some detergent onto your stain, scrub with the white part of the pre-treat cap and spread the detergent with the blue part of the pre-treat cap. Liquid is versatile, easy to use, and good for pre-soaking heavily soiled clothes too. Just pop a drop in a dosing cap, and add that direct to the heart of your wash, so all those magical Fairy ingredients can get to work straight away.